When you think of pumpkin competitions, the first thing that comes to mind is the race to grow the world's largest pumpkin. But if you can't spend all year nursing your garden fruits, there are plenty of other fun things to do with a pumpkin. And some people take those things very seriously. 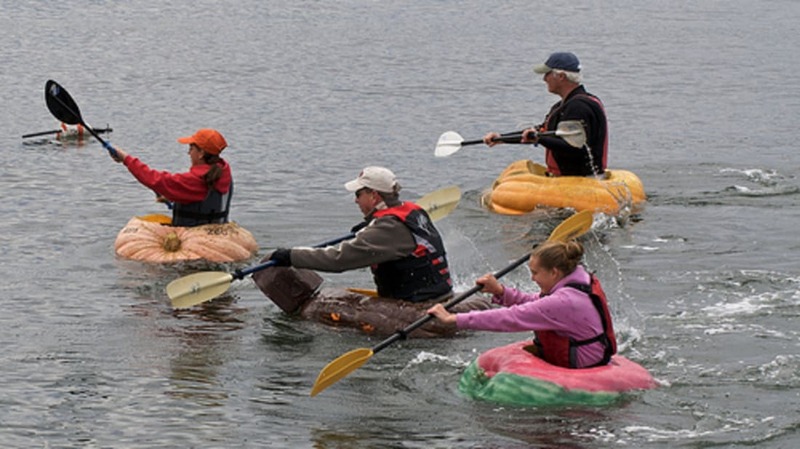 A sport that is growing in popularity is Pumpkin Paddling, in which you make a boat out of a giant pumpkin and race against other pumpkin boats. Honestly, they do this in several places. One of the biggest competitions is the Damariscotta Pumpkinfest & Regatta in Damariscotta, Maine. The pumpkinfest has contests for growing, decorating, and carving pumpkins, but the regatta is the biggest draw. Watch a video to see how it's done. The sport of pumpkin bowling has yet to reach the level of regional and national competitions. Rather, it is limited to local and even party-level games because the rules vary from region to region. In Minnesota, the Downing Pumpkin Farm has an annual competition on New Year's Day. It takes some real power to throw a pumpkin. It helps if you build a machine to do it! 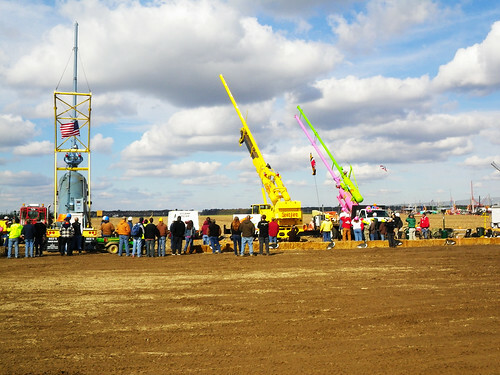 There are many community and regional pumpkin-throwing competitions, but the biggest of all is the World Championship Punkin Chunkin held the first weekend in November in a big field near Seaford, Delaware. Chunk a pumpkin as far as you can with a compressed air cannon, trebuchet, catapult, centrifugal engine, or by human power alone. Each gadget has a separate competition. If you can't make it, the best of the best will be broadcast on nationwide TV Thanksgiving evening. Here you see some of the homemade air cannons. Image by Flickr user autiscy. 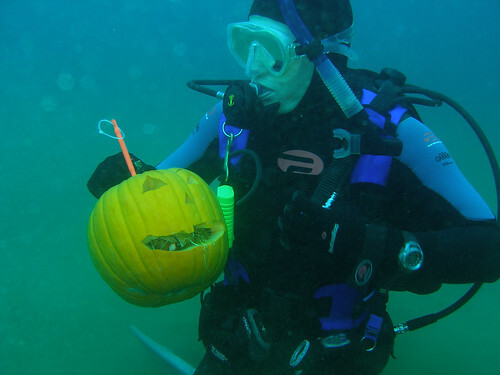 You have your everyday pumpkin carving competitions all over the country, and then you have underwater pumpkin carving. It takes longer to carve a pumpkin underwater, but you can leave your mess behind for the fish. Also, pumpkins tend to float before they are pierced, so you may have to practice wrestling them down to the carving area. Image by Flickr user David Galvan . When you Google the term Pumpkin Drop, you will get either recipes (pumpkin drop cookies) or competitions in which people drop pumpkins. But there are many different ways to win a pumpkin drop. The Mechanical and Aerospace Engineering Department at West Virginia University stages an annual pumpkin drop. The goal in this drop is to design packaging for the pumpkin that will keep it from breaking at the end of an 11-story fall. And it's a difficult challenge: materials are limited to things that are safe for the surrounding crowd, and must be biodegradable and able to be cleaned up within 30 seconds of the drop! In contrast, the whole point of dropping pumpkins for Boston University's physics department is to make an aesthetically pleasing mess. Students fill their pumpkins with paint or other materials (whipped cream is popular) to make a nice colorful splat on the sidewalk underneath the 70-foot drop. Watch the process on video. The University of California at San Diego (UCSD) drops a huge pumpkin off the tallest building on campus every October to see how big a splat they can make. In 1995, pieces flew over an area 100 feet wide! But that's not all -the pumpkin is first filled with candy, so after the drop students can sort through pumpkin guts on the ground for treats. Farms that stage fall festivals have various forms of pumpkin drops as well. HeeHaw Farms in Pleasant Grove, Utah drops pumpkins to benefit the March of Dimes. Purchase a pumpkin and use it for a target drop. Pumpkins over 500 pounds are dropped from a crane onto a car! The Great Texas Pumpkin Drop Festival takes place in San Marcos, Texas. It's a fundraising event in which participants pay to go up a tethered hot air balloon and drop pumpkins from high in the air just to watch them splat! The St. Charles Flying Service in Missouri hosts an annual pumpkin drop from airplanes! The goal in this drop is to hit a target on the ground from a plane. The video shown here is from a similar drop at Antique Airfield in Blakesburg, Iowa in 2009. They staged a pumpkin drop for 14 years, but then discontinued the event. Main image by Flickr user Chiot's Run. This story originally appeared in 2011.